Students in the Saint Louis University Athletic Training Education Program have a required internship in the summer between their two professional years in the program. The following blog post details a student's reflection on their internship experience. My name is Ryan Vallo and I am a Master of Athletic Training student at Saint Louis University. 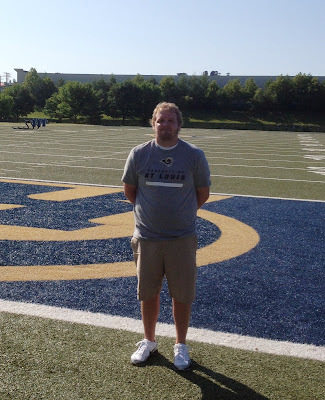 This summer, I am completing an athletic training internship with the St. Louis Rams’ organization. As an athletic training intern with a professional sports team, there are high expectations and I feel blessed to receive this opportunity. In this position, I will assist in preparing the field for daily practices, prophylactic taping of players before practice, and assisting with rehabilitation. Most importantly, I see this as a learning opportunity where I can gain hands on experience at an elite level where complete healthcare is provided. SLU AT Student Ryan Vallo on the practice field at Rams Park in Earth City, MO. The Rams’ currently have four full time certified athletic trainers and a year long athletic training intern. This gives me the opportunity to interact with five other professionals in my field and utilize their knowledge and experiences. Thus far, I have assisted with two mini camps and a few organized team activities (OTA). Next week we have our final veteran and rookie mini camp. I will be reporting to training camp July 23rd and will continue with the team through the end of preseason (August 30th). 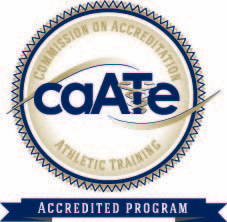 I look forward to working with and learning from the athletic training staff of the St. Louis Rams. I hope to leave a lasting impression on them and represent myself, Saint Louis University, and the athletic training profession in a positive fashion.